Marc-Andre Fleury raised his lifetime record to 15-5 in games following a playoff loss, Dan Bylsma raised his to 10-2, Sergei Gonchar and Kris Letang provided the offense, and the Pittsburgh Penguins won a hard-fought 2-1 battle against the Montreal Canadiens on Saturday night. Fleury was clearly the story on Saturday night, following 48 hours of ridicule from the always-fickle Pittsburgh fans after his disappointing performance in Game Four. But no one can complain about MAF's play in this contest, as he was only a fluky goal in the last minute away from pitching his second 2-0 shutout of the series. Beyond Fleury, the story was the defense, which also doubled as the Penguins' offense on Saturday. Both goals and four of the six individual points came from the D, which combined with Fleury to create a nearly-impenetrable atmosphere for the Canadiens, whose only offense came from a Mike Cammalleri goal with 31 seconds left in regulation. As far as the offense went, Evgeni Malkin played a great all-around game, but had only an assist to show for it. Sidney Crosby was limited to one shot on goal, as his goalless streak continued in the series. Max Talbot, Jordan Staal, and Bill Guerin were all held without shots. And we can't even point the finger at chronic underperformers Alexei Ponikarovsky or Ruslan Fedotenko, who were both scratched. If this team wants to go even further into the playoffs, this is a unit that simply has to provide more production. But the aftermath of a win is never a time for criticism. This was an extremely challenging game that took every ounce of effort from the Pens, and they pulled it out. I have a hard time nitpicking about much of anything. Fleury played better, Letang redeemed himself, and Guerin and Mike Rupp provided a presence in front of the net that had clearly been lacking. Because of that, the Pens sit just 60 minutes away from a third consecutive trip to the conference finals on Monday night, and there's no good reason to complain about that. Fleury played his best game of the playoffs tonight, so hats off to him. It's not that uncommon for him to bounce back after a bad game and play great. However, "always-fickle Pgh fans"?? Fleury didn't play well in Game 4 and some of the more even-minded fans commented on that. Are we supposed to pretend that when Fleury lays a turd that it doesn't stink? Fleury being a flake is why he played poorly in game 4. However, the same flaky quality is why he played like he did in game 5. Hopefully, he will become less flaky and more consistent as he ages in the next 5 years. In the meantime, he's OUR flake and we will just have to learn to deal with it. Bottom line: dude delivers when times are desperate. My concern is if the PENS win this series they will be drained..... 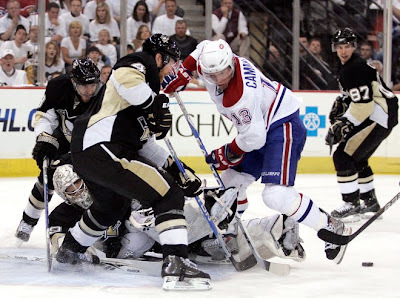 I think the canadiens want this more and it is causing the PENS to play harder... I don't think the PENS expected this hard of a fight. Think about it... This is the 3rd year the Penguins are playing into May/June.... It is evident that the long seasons are taking a toll. just my thoughts. That's a possibility, BAMA. Let's hope we close out the Habs on Monday, while Philly gets nasty nasty with Boston and extends them to at least 6 before losing. Boston lost Sturm and Krejci, which is BAAAD for them in a series vs Pens. Plus, Boston doesn't have a defensive tandem/scheme that can clamp on Sid like the Habs or Devils do. We will see one way or the other, I guess. If you don't think that every team is playing their collective asses off once they make the playoffs, let alone the second round, well I don't know what to tell you. If every player on our team was over 30 (cough, cough...redwings), then I could see the long seasons taking a toll. Guerins mystery ailment was probably just a game off for rest, to gear up for the rest of the playoffs. Gotta finish up tomorrow. The Habs are going to be spitting fire, but I am sure that their desire to take dives to draw calls and their reliance on Halak to always be able to bail them out will finally get the best of them. I said in the 3rd pd, the only way we would get a PP is if they have 9 guys on the ice or shoot it over the glass, and even then it will be evened up to 4 on 4 ASAP. Low and behold, Slash shoots it over the glass, but they come around and call Malkin for being near Gorges, who deserves a Genie for that "embellishment". That is just a little sample of what we're in for tomorrow night, where we enter the only building in the NHL where the fans actually buy calls for you and are allowed to halt play by throwing debris on the ice when they don't get every single thing they want. Sid seems to be snake-bitten and I can't think of a better team for a breakout than tomrorow. We can do this....Clinch it tomorrow!!! Gill, who's been a thorn in our side this series, was hurt last game. But if we know the USS Hal Gill from his Penguin days, he'll try his damnedest to be on the ice tomorrow night. The Canadiens are just one of those tough teams that's a little undermanned, but their goalie gets hot in the playoffs. They come along every year year and do damage. I'm with ya, Jeremy T..... Mental Burnout is tough on the whole body... Gotta end this tomorrow and pray the thugs on the other side of the state can keep the series going..